Home Blog What is Smartlipo Triplex? In the last twenty years there have been significant scientific advances in the field of body contouring. The revolutionary Smartlipo Triplex™ provides individuals a safe, fast and precise way to sculpt and mold their body. Smartlipo Triplex™, is a lipolysis treatment system supported by eight years of clinical studies. Today, it is one of the most researched laser-assisted lipolysis system available. The procedure is performed using a small tube about the size of the tip of a pen, which is inserted under the skin. The laser delivers energy directly to the fat cells through the tube, causing them to rupture. The liquefied fat is then gently suctioned out. What are the advantages to Smartlipo Triplex? During treatment fat is removed and new collagen is produced resulting in tighter tissue and firmer skin. Another plus, Smartlipo Triplex™ uses local anesthetic, so the patient is awake during the procedure, leading to a faster, easier recovery. Patients have reported some light bruising, but are able to return to normal activities within a day or two. Is Smartlipo Triplex right for me? Smartlipo Triplex is ideal for individuals who wish to sculpt their bodies by getting rid of fat deposits resistant to diet and exercise. Ideal candidates are non-smokers who have maintained a healthy weight for at least six months. During a single procedure multiple areas can be treated. As a result, several different areas of the body can be targeted at one time. To learn if Smartlipo Triplex™ is right for you, schedule a consultation with a board certified plastic surgeon who will explain the procedure and answer any questions you may have. Soderstrom Skin Institute is celebrating 40 Years in Central Illinois and happy to be part of the community in Peoria and Bloomington/Normal, IL. For more information on Smartlipo Triplex™ laser assisted liposuction, please call us toll-free at 888.970.7546. 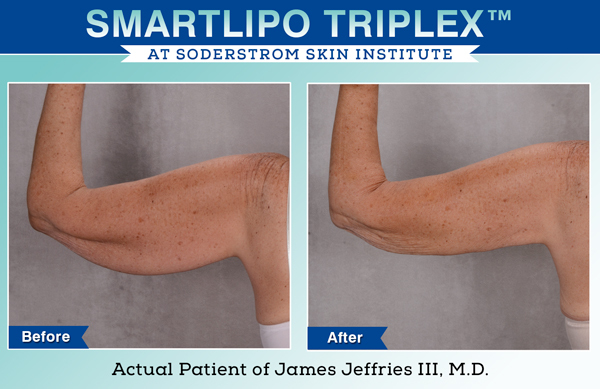 Soderstrom Skin Institute® is an exclusive provider of the Smartlipo Triplex™ in Central Illinois and the Quad Cities. To schedule a consultation with Board Certified Plastic Surgeons J. Eric Lomax, MD or James M. Jeffries, III, MD, at Normal office, please call 309.268.9980. Before and after photos available at www.soderstromskininstitute.